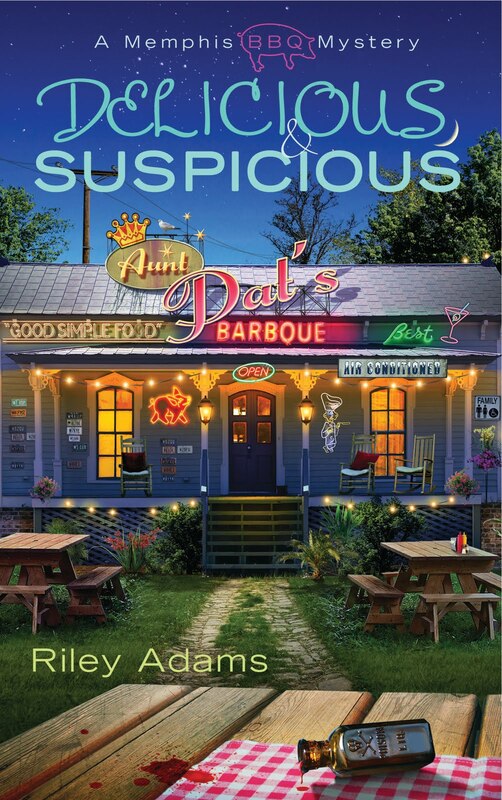 This American cosy mystery is the first in the Memphis BBQ series, written under a pen name by Elizabeth Spann Craig. I bought the book myself. Just as the setting is of great importance to a cosy, so is the writer´s ability to create interesting and often quirky characters. Lulu is by no means perfect, but she is a headstrong and considerate woman, bustling with energy and initiative. The story begins when the obnoxious food scout, Rebecca Adrian, shows an interest in Lulu´s barbeque restaurant. Lulu, her family and her host of loyal friends hope it will appear on The Cooking Channel and win the title of best local BBQ. But in a few days Rebecca rubs everybody up the wrong way so when she is found dead in her hotel room, nobody seems to miss her. The only problems are that a case of poison is not a very good advertisment for the BBQ, and that the narrow circle of suspects are all friends or relatives of Lulu. She is not the type who beats about the bush, however, so she plunges into the case to solve it the sooner the better. There is a suitable handful of suspects, and though I wondered if the ending would be too predictable over a chapter or two, the writer lived up to my expectations on that score also (I cannot reveal more without spoiling the plot). The delightful and humorous story has everything a cozy mystery needs, and a bit more, and if you should feel very hungry after having read it, Lulu is even willing to share some of her recipes with you. If you like cozies, this one is a must! This entry was posted in American, cozy mystery, Elizabeth Spann Craig, review, Riley Adams. Bookmark the permalink.